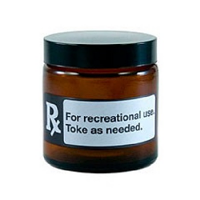 This strain is a large-yielding Indica variety with a heavy narcotic effect. 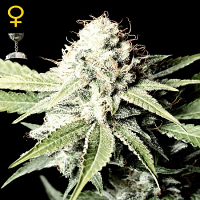 Moon Walker Kush Feminized Cannabis Seeds by Spliff Seeds: This strain is a large-yielding Indica variety with a heavy narcotic effect. Scent and taste of pungent lemon fuel kush. Grows small and squat. Excellent for treating stress, pain, insomnia, depression and lack of appetite. Potential THC level high. 80% Indica. Moon Walker Kush takes 9 weeks in total to flower, a week longer than her father, the Blue Medi Kush. 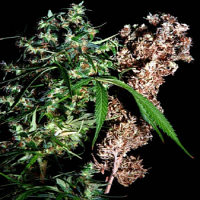 The leaves grow short and wide with a metallic glow, expressing real Californian Kush traits with a smell that is so pungent that extra care must be taken with carbon filters. This strain grows to around 80-90cm in height, making it excellent for S.O.G. and SCROG grows. This strain produces pungent, tight kush nugs at every node. 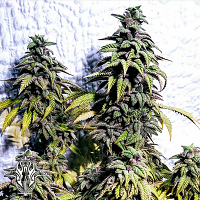 Spliff Moon Walker Kush grows one main cola with strong side branches that need to be supported later on to support the large yields. .
Genetics: Blue Medi Kush #04 x Skywalker O.G.